Place the ham bone in a large stock pot. Slice and dice the potatoes, onions, carrots, and celery. Peel and crush all the garlic cloves. Dump everything into the pot. Add just enough water to cover the mixture. Turn on the heat, bring to a boil. Then lower the heat as low as possible and simmer, covered, for an hour. Stir frequently. If you burn the bottom, the entire batch is ruined, with no hope of saving it. After an hour, remove the lid and cook for another hour or two, as the soup thickens and the meat starts falling off the ham bone. STIR FREQUENTLY! 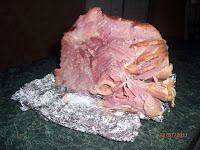 Remove the bone and bone fragments, break up the ham pieces by pushing against the side of the pot with a spoon. Ladle into your favorite bowl. Add croutons if you like.